I am a lover of all conserves. From the tangy marmalade to the stickiest of jams and curds. I remember my Grandma Corntown making Marmalade when I was wee but have never tackled it myself (I'm thinking Ma Made doesn't count). Its such a thrill to go picking your own berries to make jam and I'll definitely be partaking at some point this summer. 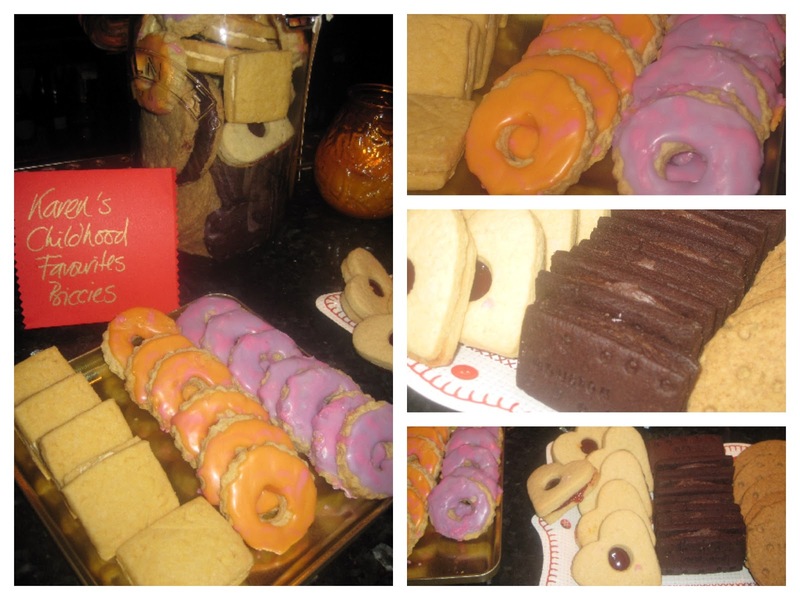 Meantime I was delighted to be contacted by MacKays who offered me some of their products to have a play around with. A box of fruity delights arrived containing Pink Grapefruit Marmalade, Single Farm Scottish Raspberry Conserve, Single Farm Scottish Blackcurrant Conserve and Orange Marmalade with Champagne. 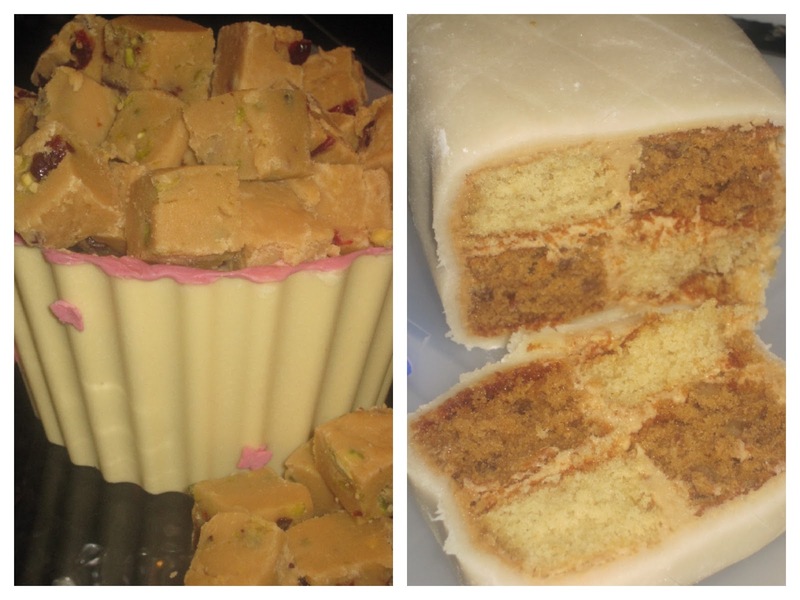 My first creation was made to take along to Aberdeen's Pinnies & Petticoats Baking Club. 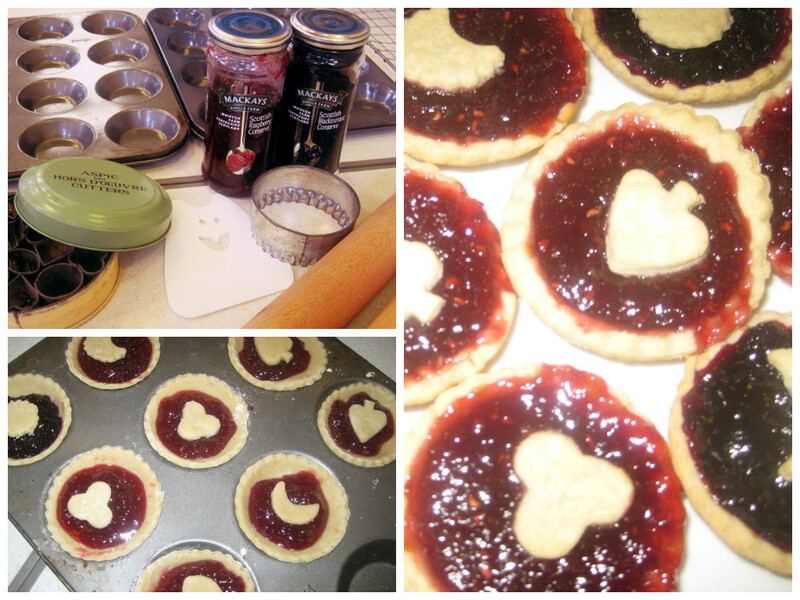 I wanted to utilise a mini tartlet tin I'd purchased from Lakeland but never got round to using. Don't be put off by the seemingly lengthy list of ingredients for this. It can easily be made in parts. 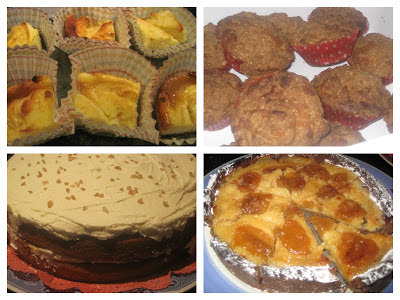 I did the Crème Pat on Monday, the Pastry cases on Tuesday and the final assembly on Wednesday. Craig David eat your heart out. I make all my pastry in the food processor but you could of course make by hand. Everything goes in and is blitzed until it looks like breadcrumbs. Very gradually add water until it comes together into a ball. On this occasion I hardly needed any as I'd used a very large egg. Wrap in cling film and refrigerate for at least 30 minutes. I was somewhat OCD in my approach to the tartlet making as I measured exactly 9g of pastry for each case, rolled it into a ball and squashed it into shape with a well floured wooden dibber. A wee bit of trial and error to get the best technique but I reckon the exact weighing was worth it. 10-12 mins at 200 degrees or until they are turning golden. Cool and keep in an airtight tin until you are ready to fill them. Whisk together the eggs and sugar in a large bowl until they turn pale. Whisk in the cornflour and flour and set aside. Heat the milk and vanilla extract to a gentle simmer. Take off the heat. Slowly pour half of the hot milk into the egg mixture stirring the whole time to avoid scrambled eggs. Pour the milk/sugar/egg mix back into the remaining milk in the pan and bring to the boil whilst whisking continuously. Cool quickly and refrigerate until needed. Put a teaspoon of Strawberry jam into half the tartlets and the same of Raspberry into the remainder. 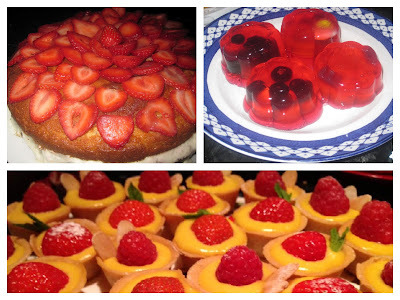 Decorate the Strawberry tartlets with a Strawberry and a small mint leaf. 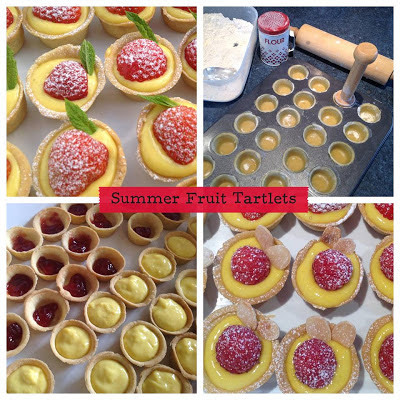 Sift icing sugar over your Summer Berry creations. 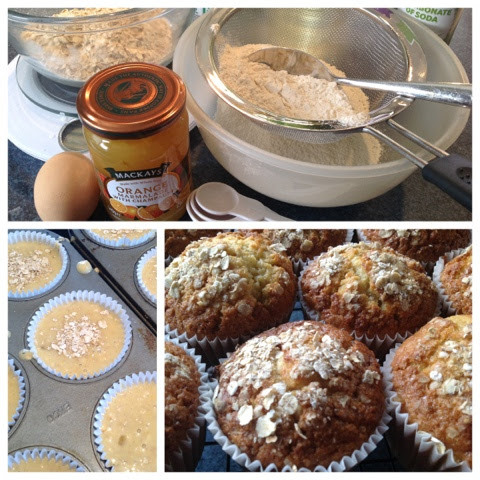 Next up a breakfast muffin using Marmalade and Porridge Oats. Great at any time of the day. Foodie Loon declared this the best muffin I've ever made which is high praise indeed. Its fantastically moist and exceedingly tasty. In another combine all wet ingredients, including the marmalade. Spoon into muffin cases and sprinkle the tops with porridge oats and demerara sugar. 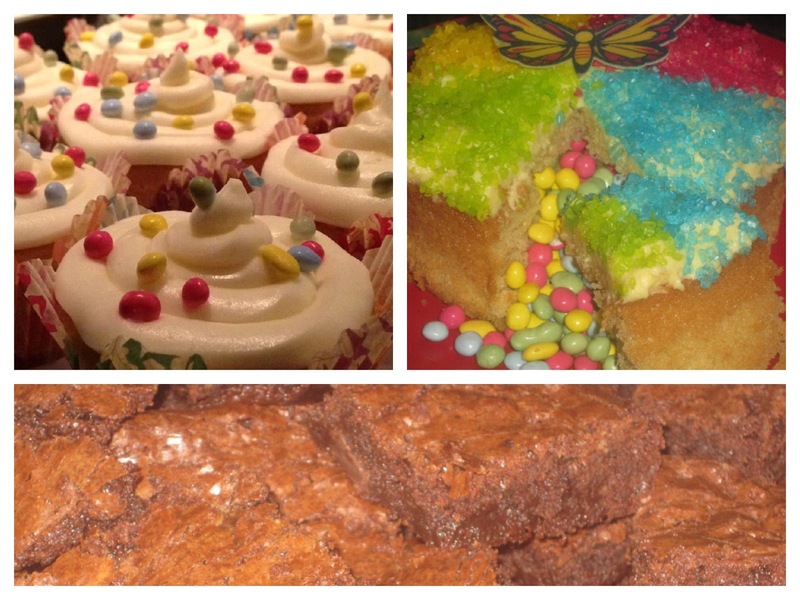 I've been doing a series of cookery "lessons" on a voluntary basis in my kids school this term. 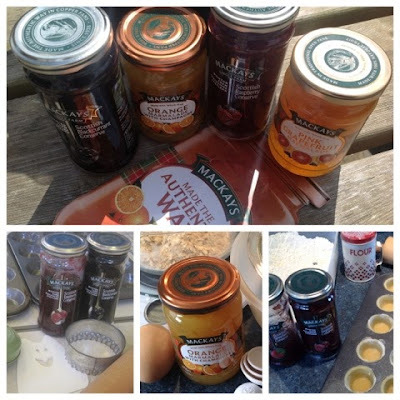 The P6 topic of Victorians presented a great opportunity to make some Jam Tarts. I'm sure both Mrs Beeton and the Queen of Hearts would have been proud of their efforts. Much debate among the pupils over their preference between Raspberry and Blackcurrant jam and disappointment from others that I hadn't brought along any Strawberry. Whilst I'm a big blackcurrant jam fan I reckon you can't beat raspberry in a jam tart. Alas I never even got to sample one as they disappeared in a flash. I've still got my jar of Pink Grapefruit Marmalade to use and I'm thinking it might work very well in my Orange & Lemon Chicken Recipe. Watch this space for news on Orange and Pink Grapefruit Chicken. Thanks to Mackays for supplying me with their products. They are a family run firm who source all their Strawberries, Rasps and Blackcurrants from the Berry fields of Perthshire, Angus and Fife. The jam is made by hand using traditional methods in copper pans to give a fantastic home made taste. No computers or robots in the factory. Only experienced artisan jam makers. For a different variation on Breakfast Muffins take a look at this clever recipe for Weetabix Muffins from Elizabeth's Kitchen Diary or Jane at The Hedgecombers Chocolate Orange Muffins. I was really disappointed earlier this year when a Foraging and Dining Event that I had booked to attend with Robin Harford and Paul Wedgwood was cancelled at the last minute. Despite this I made my own First Foray into Foraging and as a result of a chance meeting at Taste of Grampian purchased the gorgeous Foragers Kitchen by Fiona Bird. I think I may be officially hooked. 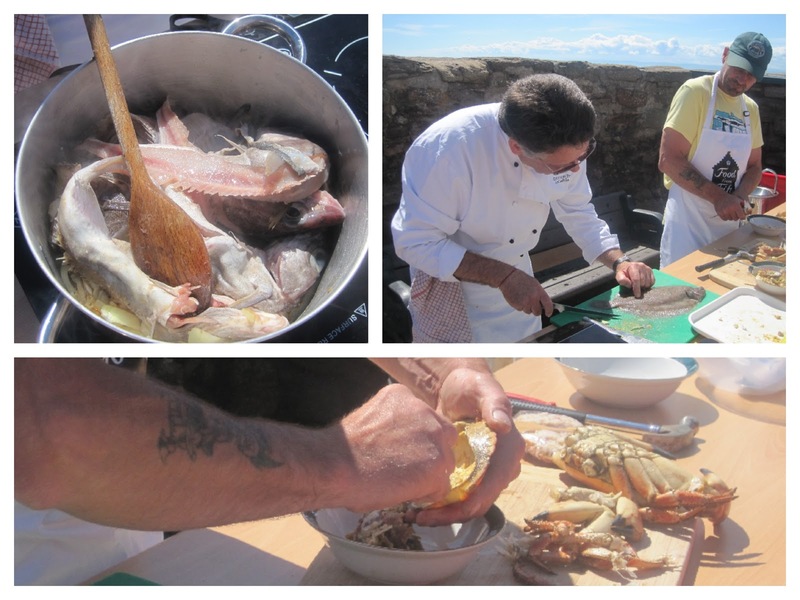 I had tentative plans to attend the Crail Food Festival but my mind was made up when I saw there was to be a Coastal Foraging Walk with Mark Williams of Galloway Wild Foods. The four of us booked on to the afternoon session. Boy was almost as excited as I was at the prospect. When we arrived at the striped umbrella over the smoothie bike of The Fife Diet stall to register Mark was busy cooking up a wild food lunch for himself having found the queues too lengthy elsewhere. Around 30 of us set off towards the beach to begin our foraging walk into the edible landscape and we didn't have to go very far before we came across our first find. I'm not going to even begin to attempt to tell you how to identify and what to do with all that we came across. Instead, where I can, I will link up to Mark's website which will provide you with a wealth of knowledge for each item. The yellow hue of Wild Cabbage was spread across the banking alongside the beach. We all tucked into the flowers, seed pods and leaves. Plenty of Bramble bushes to be found too. This is probably the one foraged food that we are all familiar with and have no problem in identifying. Interested to find out that the young stems can be candied much like Angelica. Curled Doc has a lemony sorrel like flavour when its not being used on a nettle sting. The pretty Ox Eye Daisy's leaves are edible and pleasant. The tips of the Sticky Willy (goose grass) are good to eat when young and tender. 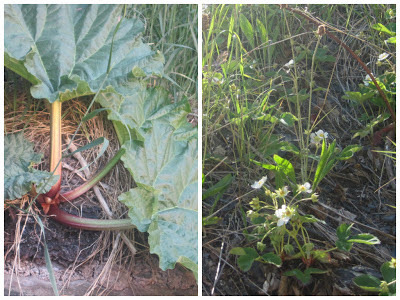 Dandelions and Nettles are also easily identifiable and edible. 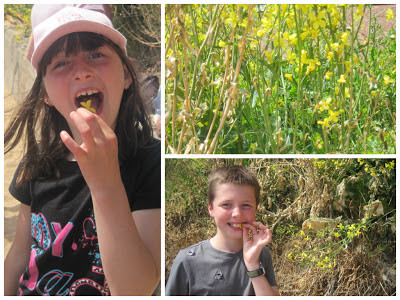 Boy and Girl loved Mark's nettle eating trick even if he did get stung in the process. Really interested to hear of five different stages of eating for Elder. Another easy one to identify with its gnarled random trunk and to be found almost everywhere. I will definitely be giving the Champagne and the Vinegar a try myself. Great to find that Plantain is useful for something other than playing soldiers. Apparently the leaves are much better to neutralise a nettle sting than a Doc whilst they and the flower tops have a mushroom like flavour. The goose foot shaped leaves of the Orache had a moist salty flavour which I really liked. Mark's favourite wild vegetable next in the form of Hogweed. Not to be confused with the deadly Hemlock or its big brother Giant Hogweed. The pungent mustardy flavour of Scurvy Grass is packed full of Vitamin C. The perfect plant for sailors to forage prior to a long trip at sea. A couple of garden escapees up next. Strawberries and Rhubarb. Probably got there from being tipped out along with garden waste. A much more controversial escapee which appeared to be making a takeover bid in the area was the invasive Japanese Knotweed. Very surprised to learn that this is edible as a young shoot. Perhaps if we all started foraging for it we could stop it in its tracks. Last but not least as we headed back to the harbour a quick look at the slippery world of seaweed. 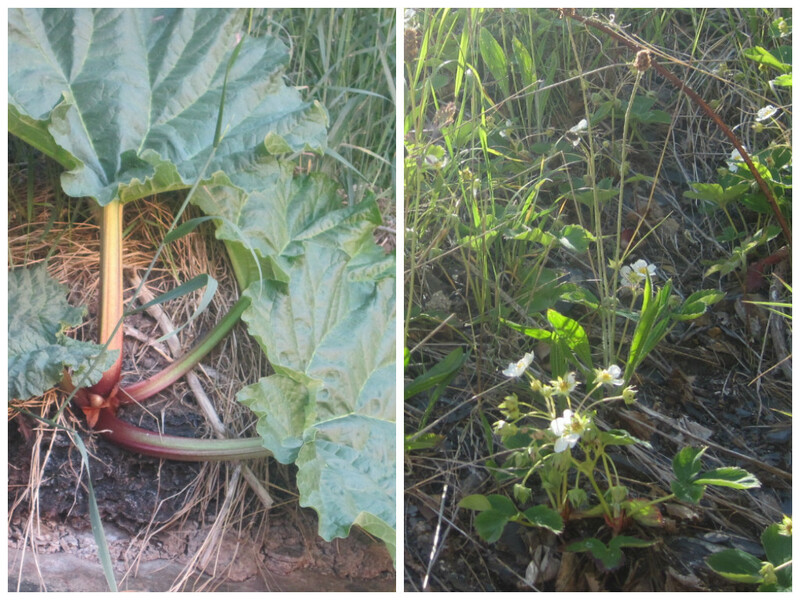 Gutweed, Dulce and Wrack. 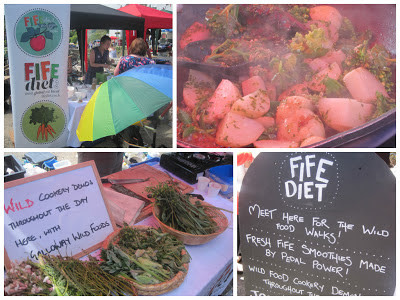 Back to the Fife Diet stall and we charged our paper cups with Elderflower Champagne as Mark cooked up a foragers feast. First off Hogweed fried in copious quantities of butter to accompany Lavabread with Smoked Mussels. However the pièce de résistance was definitely the hand rolled wild food sushi. Not entirely sure what all was in there but there was pearl barley instead of rice and an abundance of foraged greens topped off with some beautiful flowers and a drizzle of elderberry vinegar. A work of art that was as good on the palate as it was on the eyes. 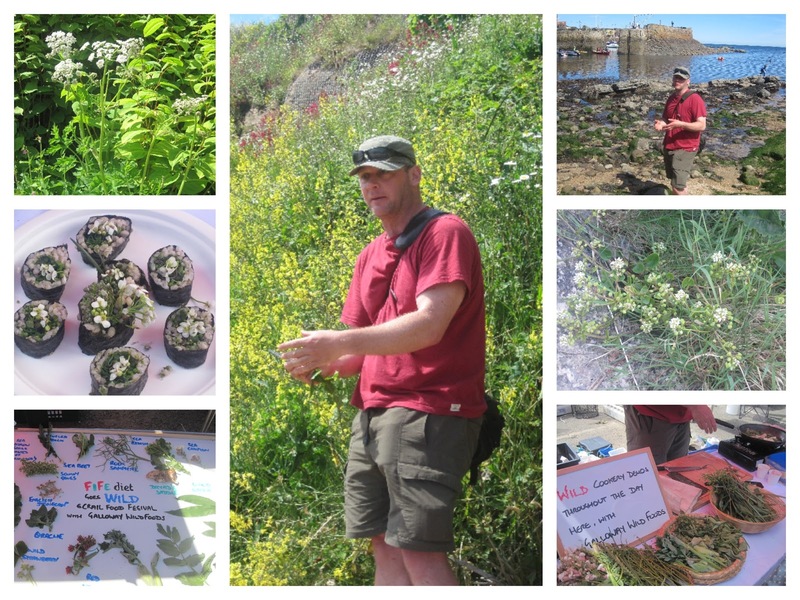 Thanks to Mark Williams for a great foraging adventure and to The Fife Diet and Crail Food Festival for facilitating the event. Only two more weeks until the end of term and Summer Holidays. We then head to Italy for a fortnight and I am so not organised in the slightest. Any top tips for Florence, Pisa, Tuscany direction would be most welcome. And if you could procure suntan lotion and pack suitcases for me so much the better. 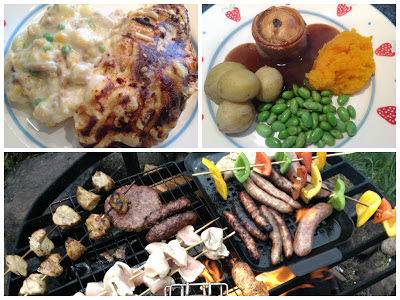 Last week's meal plan was followed pretty much to the letter but not many meals to share as there was also eating out, take away, Glamping and Pinnies & Petticoats Cake Club to squeeze in. Yet again we had a fantastic time at High Seas Hobbit. 12 of us this time. 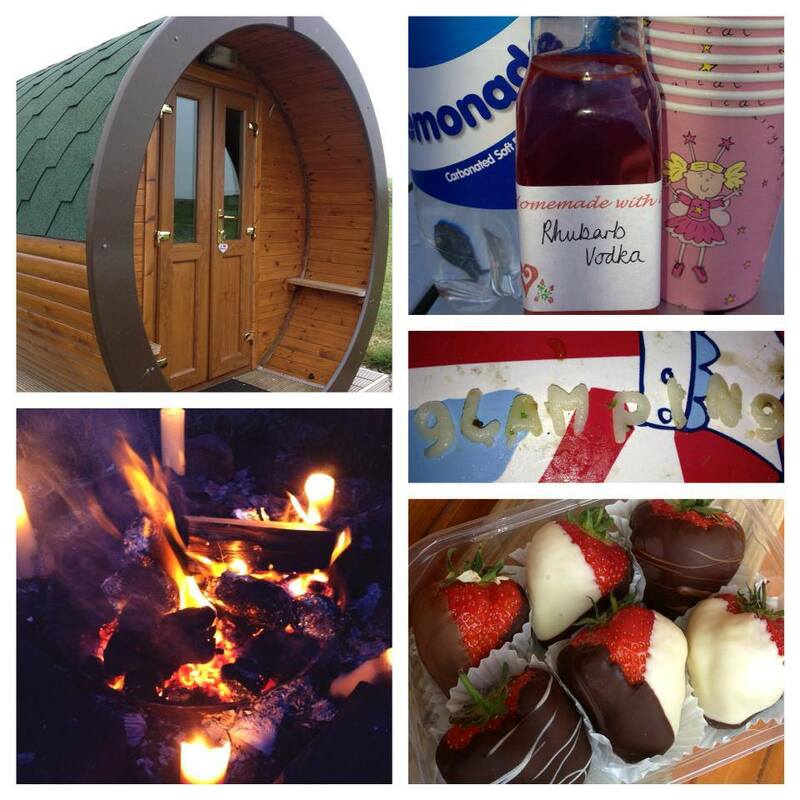 Mums glamping in the Hobbit House and Dads and Kids under canvas. Bloggage to come later on this week including Rhubarb Vodka, Chocolate Covered Strawberries, Bagpipes and ABC Pasta Salad. Lots of eggs to use up this week as I ordered three dozen to have plenty for pavlova and crème patissière making. Then Foodie Loon came home with some procured from a colleague who keeps chickens. 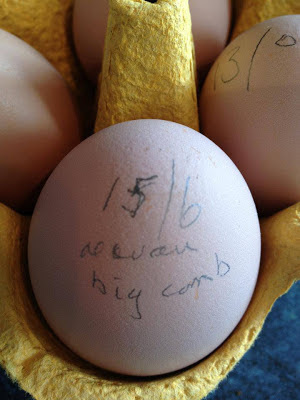 Can't get better food provenance than knowing my egg was laid by a Maran Chicken with a Big Comb on the 15th of June. Traceability at its best. Using up some leftover sausages from over purchasing for our camping trip. Egg in the yorkies. The first of two new 2 in 1 recipe mixes I'm trying out for Schwartz. Another eggy dish with the added twist of Stornoway Black Pudding. I'm not 100% convinced but Twitter chums say its great. I'm off to the Theatre with a friend to see 9 to 5 The Musical. We'll eat out and the troops can fend for themselves as long as they accompany with a fried egg. Busy day at our Village Fair followed by a BBQ at friends. 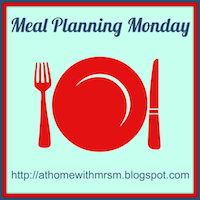 As per usual I'm linking up with Mrs M and the other #MealPlanningMonday bloggers. Head on over and see what everyone is up to. We had a special guest at this month's Pinnies & Petticoats Aberdeen Baking Club. Photographer Andi Ramsay of Developing Perceptions. He was there to talk food photography and give us some top tips to help us better preserve our wonderful baked creations before they are devoured. 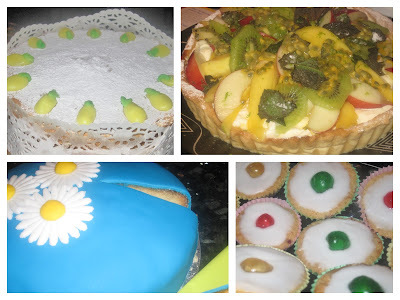 With this in mind there was no theme for the bakes but left up to the individual to make something worthy of its own photoshoot. I opted to make some Summer Fruit Tartlets utilising a Mini Morsel Tin and wooden dibber that I had purchased back in the January sale from Lakeland. It had embarrassingly been sitting in the cupboard ever since. Combined with my first attempts at both Pâte à Fonce and Crème Patissière I was pretty chuffed with how well they turned out. Now that I've told you that we had a food photographer giving us hints and tips you'll no doubt be closely scrutinising my pics. I'll put my hands up and admit they are by no stretch of the imagination good and don't do the food the justice it deserves. Hopefully I can improve them a wee bit thanks to Andi's advice. Our cake club venue at Tiger Tiger certainly doesn't make a good studio. The dark backroom bar of a nightclub is not the best setting for food photography. Not a drop of natural daylight to be found. As always a fantastic selection of cakes and bakes and a really good turnout of folk. New faces and old faithfulls. I know I haven't got photos of everything and I don't know exactly what they all are (apart from delicious) so hopefully the pictures will tell the story and for this post I'll concentrate on sharing some pearls of food photography wisdom. Star Baker Award has to go to Karen for her selection of Childhood Favourite Biscuits and a special mention to Colene who's giant white chocolate cupcake case was demolished by Boy and Girl for breakfast the morning after. Many of us put a lot of time and effort into our cooking and baking but are disappointed when we try to capture our creations on camera. So often the photo just doesn't convey how good something looks in real life. I bet many of you are nodding along in agreement with this. I know I was. Whilst Instagraming and quick iPhone photos for Twitter and Facebook do indeed have their place, Andi explained that there is a huge difference between taking a photograph and making a photograph. A good food photograph has to tell a story. There should be one main subject and you have to think your shot, composition and accessories through. Move things around and play about a bit to make that perfect picture. 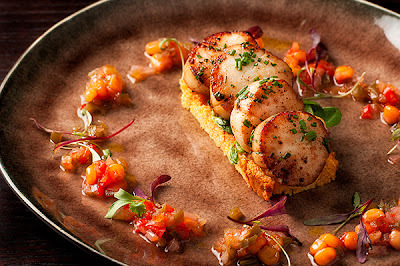 Food photographs should be backlit with natural light. A kitchen window can do this for you. Then comes the issue of quantity versus quality. A bounce board (or sheet of white paper/foam core) can help solve this and fill in the shadows. To get a good composition you need to fill the frame and ensure that the most prominent item is in focus. Don't feel obligated to include the whole dish in the shot and remove superfluous objects from the background. Next up, the rule of thirds. Like the offside rule this is a concept that some of us found very difficult to get our heads around. Think of a noughts and crosses grid across your viewfinder dividing it into nine equal squares. The focal point of the shot should align itself with one of the central four intersections. Clear as mud eh? Have a Google to find out more. Your camera may well have an option available to turn on said gridlines. Stability is the key. If you don't have a tripod balance your camera on whatever is available. A stack of books, kitchen worktop, pepper grinder in a restaurant. The food ain't going anywhere so as long as the camera is stable the shot shouldn't be blurry. Finally when you think you have the perfect photo in the bag, if you don’t have an overwhelming urge to lick the back of your camera, then you’re not there yet. Are you licking the screen yet? Yup its one of Andi's. 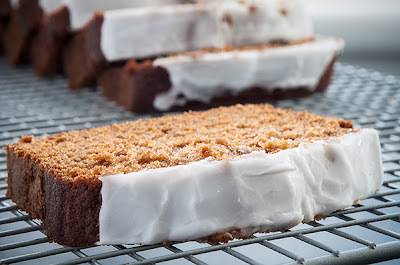 As is the iced gingerbread below. I've got a lot to learn to get to the licking stage. Meanwhile I'm off to Hobbycraft to get me some white foam core board. I guess I might be forming an orderly queue behind the rest of the Pinnies and Petticoats contingent. 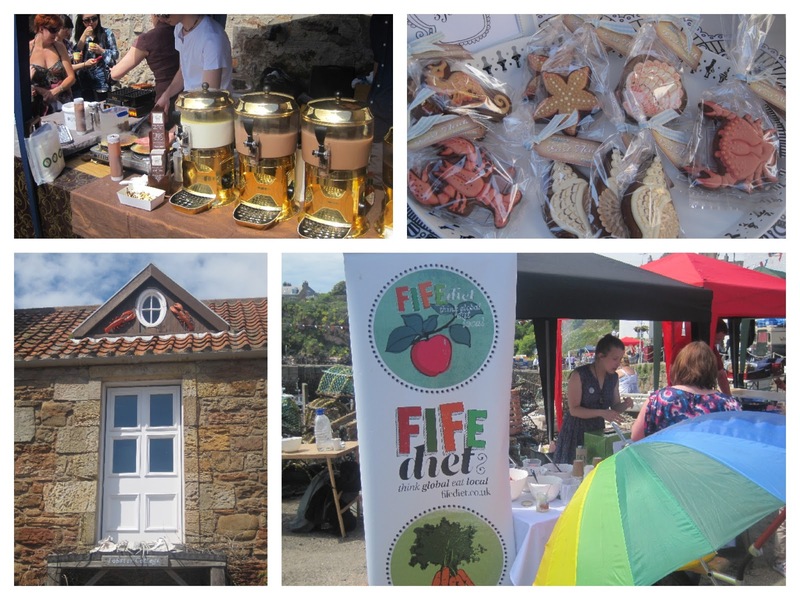 Sunshine, Sandcastles and Seafood was the order of the day at Crail Food Festival on Sunday. What a scorcher of a day it was. 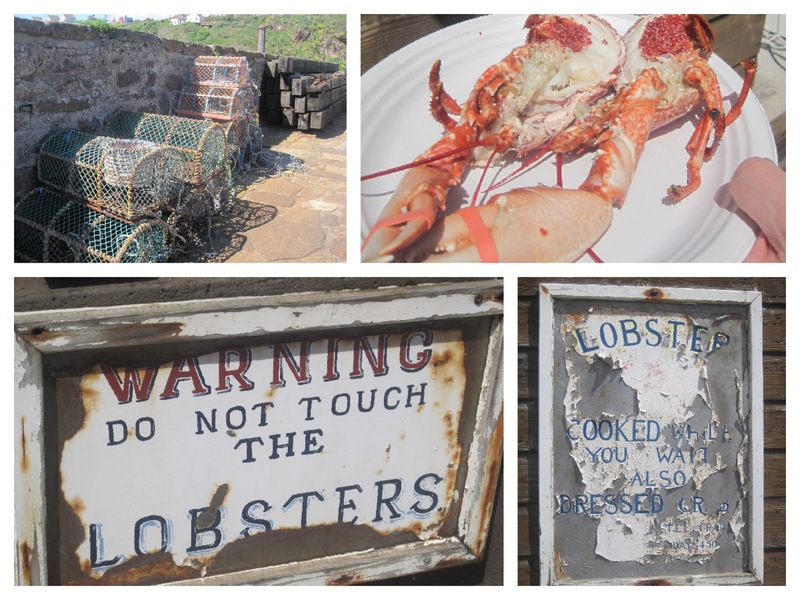 I have a real soft spot for the whole of the East Neuk of Fife and all its wee nooks and crannies. 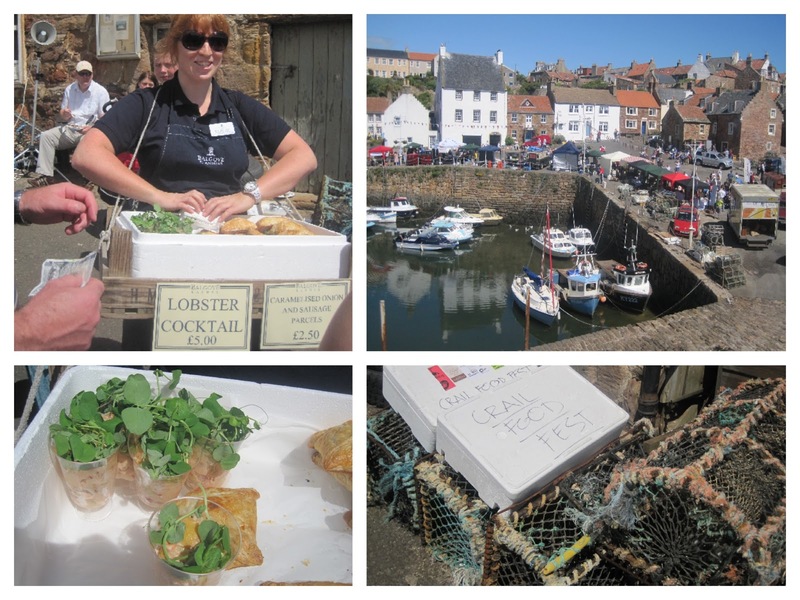 Crail Harbour was an absolutely idylic setting to showcase the fantastic produce of the Fife Larder. 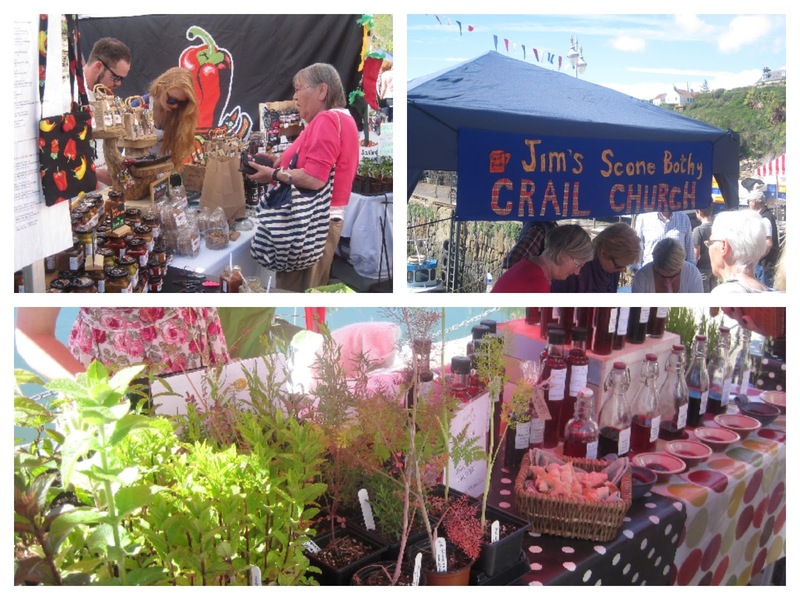 We arrived just as the Harbour Sunday event was starting at 11am so got a good nosey round all the stalls before it got too busy. Plenty of seafood of course but also chillis, strawberries, preserves, venison, chocolate, herbs, vinegars, cakes, gingerbread, scones, ice cream, burgers, pizza and garlic bread. 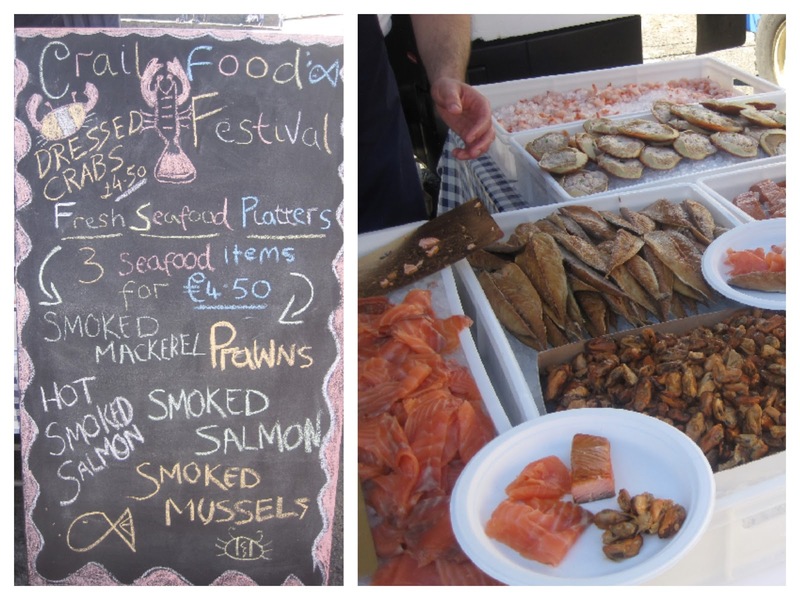 Wonderful seafood on offer from the ramshackle Reillys Shellfish Lobster Hut. Here you could pick your lobster from the tank and it was freshly cooked while you waited. Dressed crab was also on offer. Hard to believe such gourmet cuisine was emerging from such a shabby shed but that was all part of the charm. 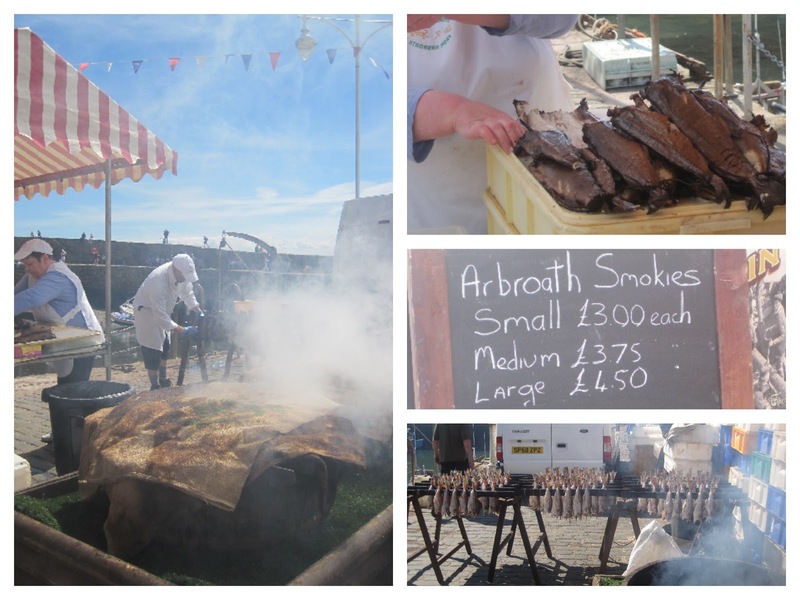 Arbroath Smokies from Iain R Spink can always be smelt before they are seen. When you do see them its through a pungent cloud of smoke. Such a treat to see them being smoked in situ and to eat them at their best, fresh from the barrel. Chillilicious provided a fantastic combination of food and art and I purchased both. A gorgeous glass nibble dish formed from a bottle, Chilli Cola and some Chilli & Coriander Oatcakes. A couple of Vinegars were procured from Penny at The Little Herb Farm who appeared to be doing a roaring trade with lots of items sold out. I got myself some Blackcurrant & Thyme and Blackberry & Rosemary. Plenty of places to eat at as well as buy. 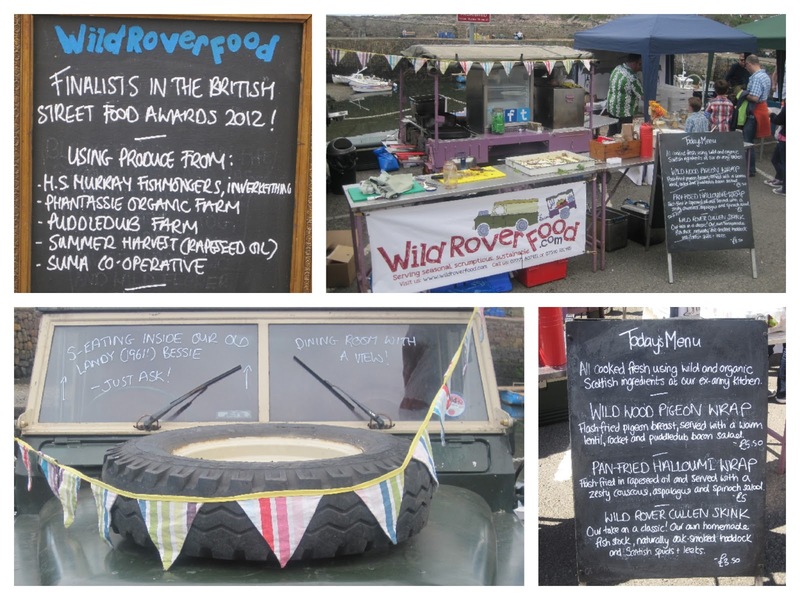 Absolutely loved Wild Rover Food with their Land Rover and pop up ex Army Kitchen. Also loved the ethos behind their cooking and their sustainable and ethical stance. Turns out that Cat's parents own the Gypsy Caravans in Stirling where we Glamped last month. Scotland is such a village. Caught a demo by Jim Knox showing us how to Dress a Crab. He made it look oh so easy. Having seen it done I'd certainly be up for giving it a go armed with the required tools of the trade. Hammer. Screwdriver. Kirbygrip. He also shed light on the somewhat worrying "dead mans fingers". They're not going to kill anyone if you leave them in but just won't taste very pleasant. Phew. 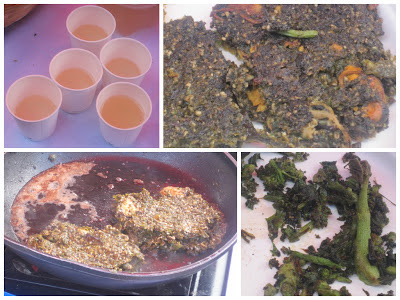 Christopher Trotter, Fife’s Food Ambassador, showed us how to make a fish stock. Thanks to his tips I'll be able to extend my repertoire beyond Nick Nairn's Chicken Stock. I'll be at the fishmongers asking for a free bag of fish bones before the week is out. Boy and Girl were desperate to give the Smoothie Bike on The Fife Diet stand a go. 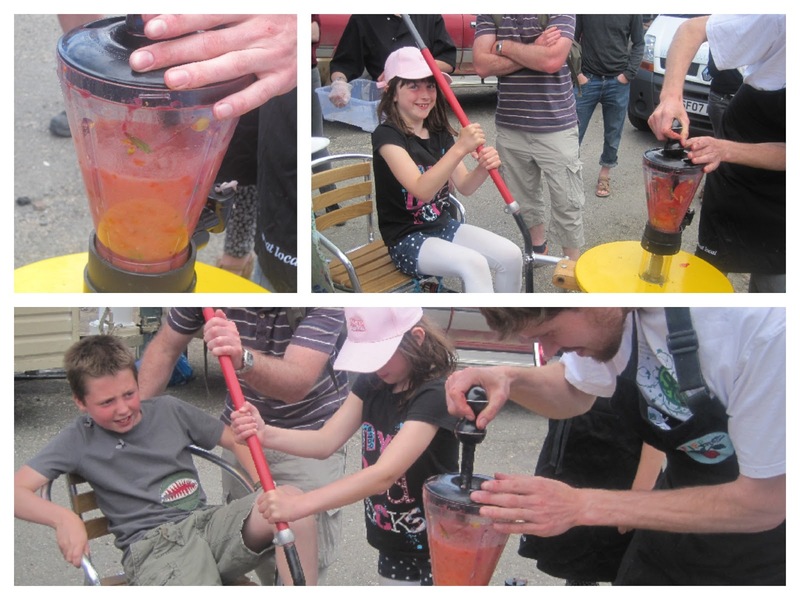 They made their own smoothies with local berries and foraged food and returned later on in the day to help avert a crisis. The Doorstep Bakery had run out of the tomato sauce for their pizza. Seriously Good Venison stepped in with some left over tomatoes from their salad for burgers and a tomato sauce was blitzed. Community teamwork at its best. Tummies were rumbling by this time. 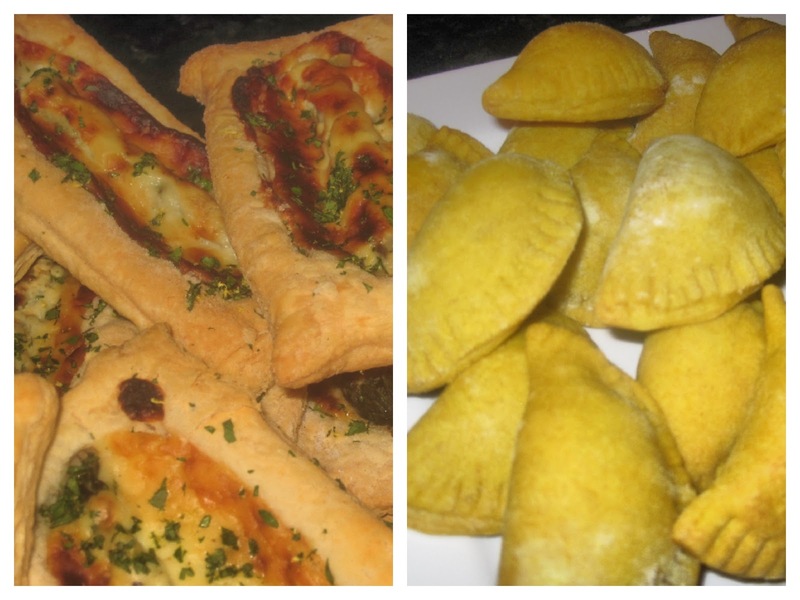 What to choose for lunch? Girl and Foodie Loon opted for Venison Burgers from Seriously Good Venison and we bought four of their Wee Veni Pies to take home. Boy and myself couldn't resist the seafood so opted to share a Seafood Platter of Smoked Mackerel, Hot Smoked Salmon and Smoked Mussels with a side of a Dressed Crab. A wood fired Garlic Bread completed our feast. Could there possibly be a better location for an al fresco Sunday lunch? I very much doubt it. Foodie Loon clearly wasn't quite full as he spotted the ladies from Balgove Larder with their tray of goodies and opted for a Caramelised Onion and Sausage Parcel. Boy and Girl chose Strawberries and a Chocolate Topped Waffle for their desert. Plenty of non foodie activities laid on to keep little (and big) kids happy. 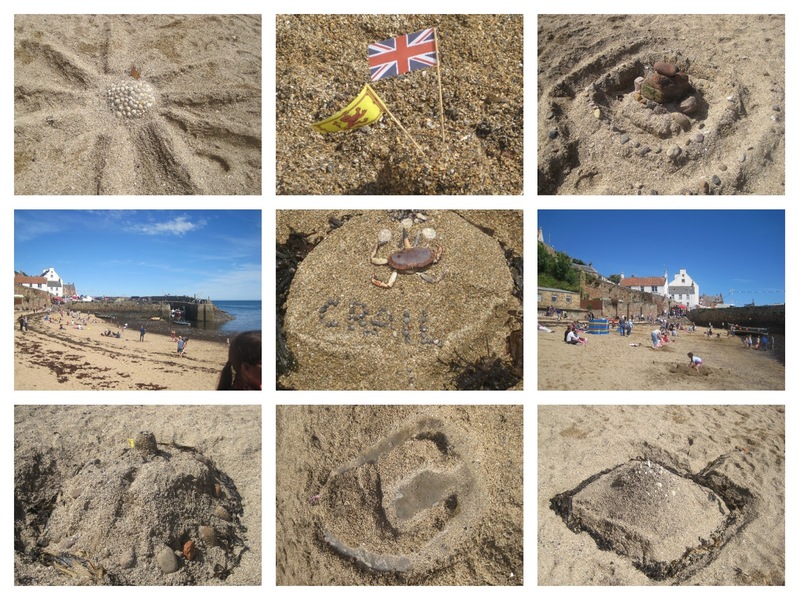 Sandcastle Building Competition, Parachute Games and a Scavenger Hunt. 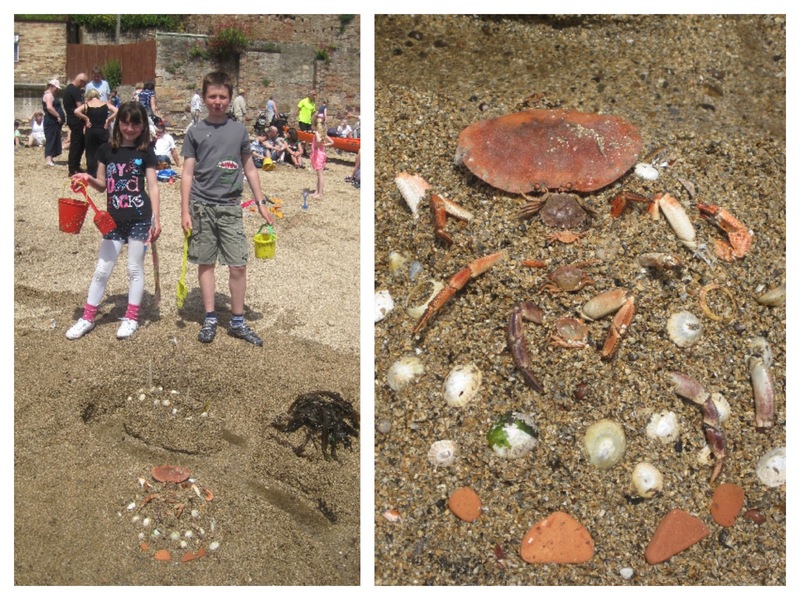 Great fun had and some pretty spectacular sandy creations. 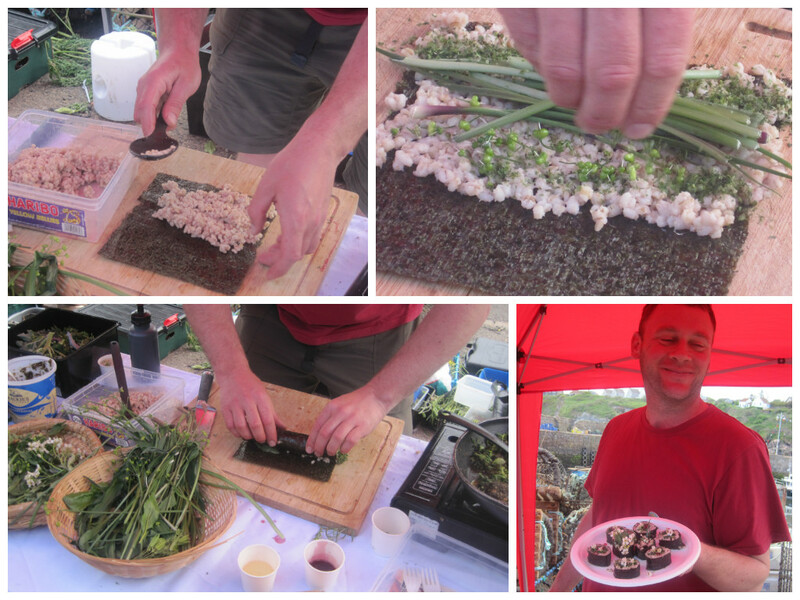 One of the real highlights of the day was a Coastal Foraging Walk let by Mark Williams of Wild Galloway Foods. Absolutely loved this and it deserves a blog post of its own. 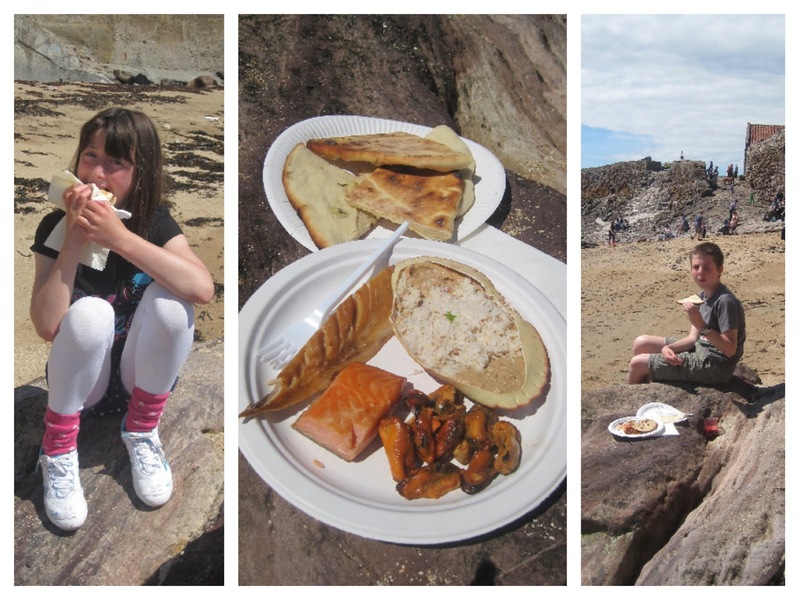 Coastal Foraging Walk at Crail Food Festival. 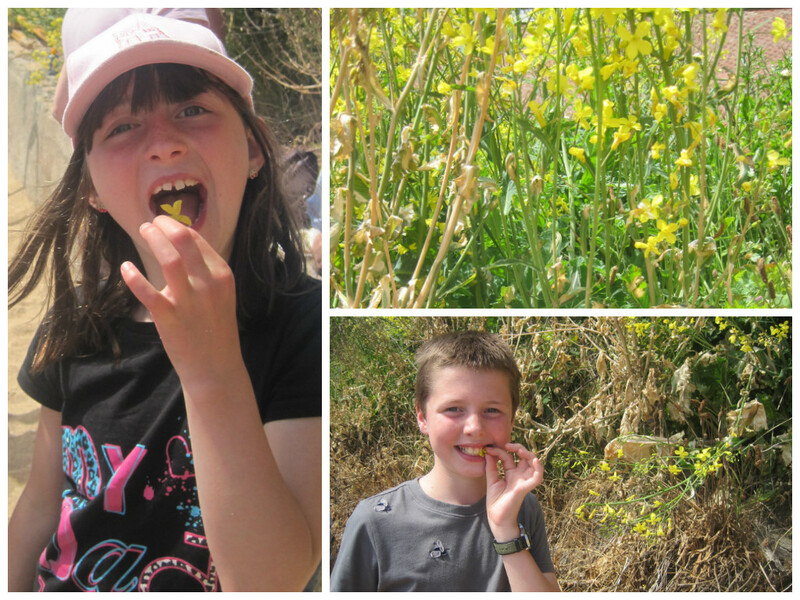 After our forage we cooled down with Ice Creams from Janetta's before watching Mark cook up some wild foods. All too soon 4pm and the close of the festival had arrived. We managed to sneak in some after hours purchases of White Hot Chocolate, Hazelnut Hot Chocolate and Salty Popcorn topped with Chocolate Sauce from The Pittenweem Chocolate Company. The last minute Popcorn was definitely my non fishy highlight of the day. 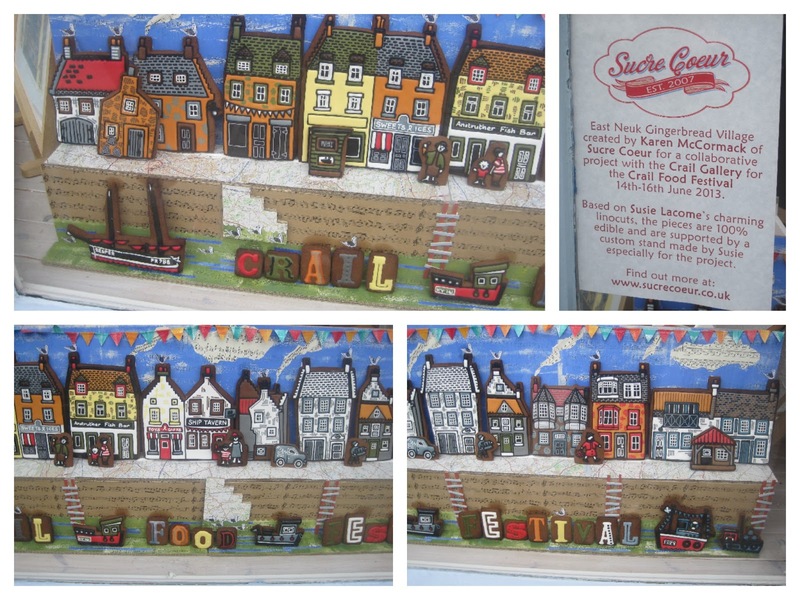 As we headed back to the car we made a detour to track down the wonderful Gingerbread Village made by Sucre Coeur. You can read all about its creation here. It truly is a work of art and as a result Karen has been asked to create a Gingerbread Edinburgh. Can't wait to see what she comes up with. 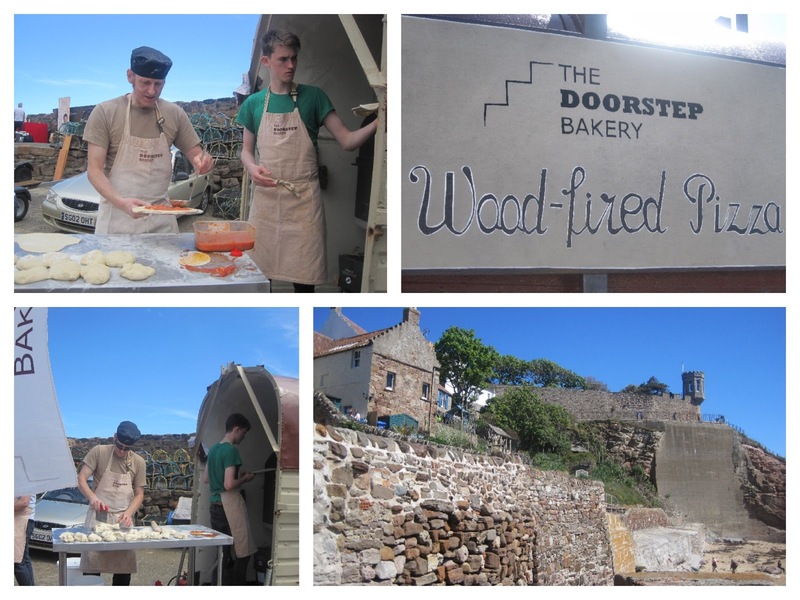 Alas no time to visit any of the participants on the Crail Food Trail but what a brilliant idea. 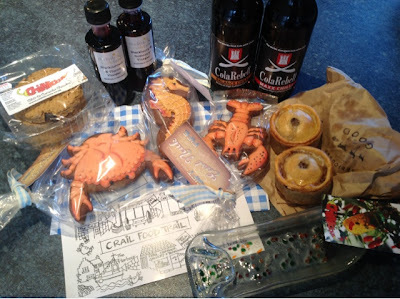 Home with a bag full of Foodie Goodies, a touch of Sunburn and definite plans to return to Crail for next year's Festival. I may even of had a sneaky peek on www.fifespc.co.uk at houses in the area. 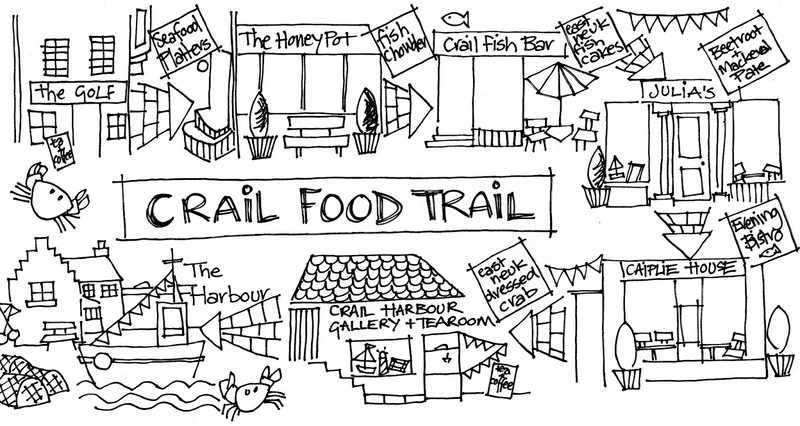 My own holiday home would mean I could definitely attend both the Saturday and Sunday activities in 2014 and complete the Crail Food Trail. Fingers crossed my numbers come up on Saturday night. Bell Ringers Cottage will be mine.